Need a way for customers on your Magento 2 site to be able to leave comments for their order? We’ve built a lightweight extension that allows your customers on a Magento 2.0 site to be able to leave comments during the checkout process. We built this as part of a new Magento 2 site design and build, because this feature wasn’t included in the base, default version of Magento. During checkout, a customer can leave order comments. The order comments will appear on the order detail page in the Magento admin. The order comments will appear on the order details page for the end user. The system does not add any tables or columns to the Magento 2.0 database. 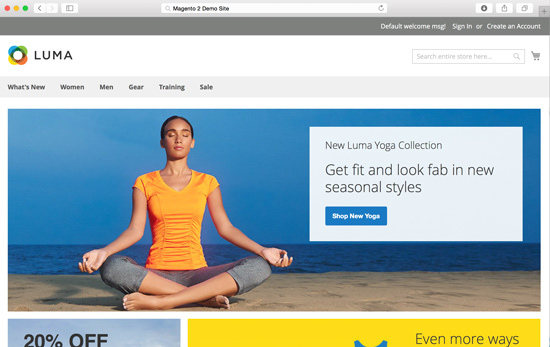 The extension has been designed to work automatically with the default Luma theme of Magento 2.0. No design changes to the front end or back end system is required. The extension has been designed to not conflict with other extensions, and work smoothly with Magento 2. The module works with the existing Order Comments system that an admin user might append to an order and notify an end user of their order status. This extension was coded out by one of our top, certified Magento 2.0 developers on the Customer Paradigm team. The code has been peer reviewed by the rest of the department and tested extensively. Update: The extension has been updated on April 21, 2016 to include better support during guest checkout, including when terms and conditions of service are checked. Here’s how the system works: First, let’s start with a blank Luma Magento 2.0 site, using the supplied Magento sample data. Here’s the cart page – you can see that in Magento 2.0, the checkout process has been dramatically streamlined, so it’s much, much faster. On the admin side, the order information is now included on the order. Q: I installed the extension, but the order comments are not showing up!?! A: Make sure you enable it in the admin area: Stores –> Sales –> Checkout –> Checkout Options:[x] Enable Order Comments.You might need to make sure it’s enabled for your particular Website or store view. Also, if you’re in production mode, you may need to change over to development or default mode, recompile, and then put the site back into production mode for things to work properly. Q: Why are order comments not part of Magento 2 by default? A: Order comments are part of the Magento 2 platform, but only for admin users who want to append order comments to a customer’s order. In this case, we’ve created the functionality to make it work for end users to be able to do this easily at checkout. Q: I’ve heard that adding extensions to the checkout page can break things in Magento 2.0? A: We’ve coded this extension in a way that conflicts with core functionality and other extensions should be minimized. With the Magento 1.x platform, we’ve spend thousands of development hours dealing with extension conflicts, and we made sure to minimize this as much as possible. Q: Can I run this on my staging and development sites, too? A: Yes, we also know that your staging and dev sites for your Magento 2.0 sites might have completely different URLs, so we’ve made licensing easy for you. Q: Can I have the order comments show up in order emails? A: Right now, this is not a feature that has been built into this free Magento 2 extension. We have this on our list to do in the future if this is something that people would like to see (or pay us to do). Q: Can end users leave order comments on each item of the cart? A: No, at this point, this extension only allows the customer to be able to leave a single comment onto the entire order. Q: Can Customer Paradigm install this for me on my Magento 2 site? A: Yes… contact us at 303.473.4400 or Visit here to have a real person contact you now >>. Q: Can Customer Paradigm customize this extension for my Magento 2 site? A: Yes… we’re happy to help! Please contact us at 303.473.4400 or Visit here to have a real person contact you now >>. Before using the order comments extension in your Magento 2.0 store, it must be properly installed to notify your Magento site to the existence of the extension. (Recommended) Run a backup of the code base and database. Unpack the installation package and upload to your store’s root folder. Using SSH, login and navigate to your store’s root folder. Please flush system cache by navigating to System->Tools->Cache Management from the admin panel. Log out and log back into the admin panel. 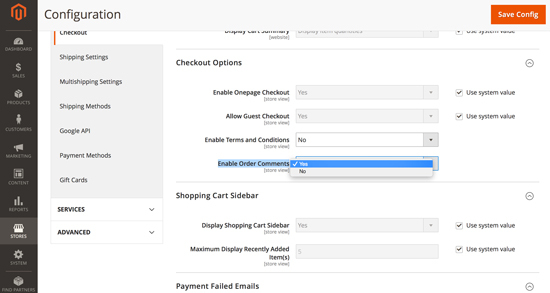 If you have successfully processed these steps, you should now see the Magento 2.0 Order Comments for Checkout extension active by testing out the order page (displayed above). We make it easy to remove the extension. To ensure the extension has been disabled, please navigate to the front end of the site and view the checkout page. If order comments are no longer showing up, your extension has been disabled. You may now delete all of the code associated with the extension located (from your Magento root folder) at: app/code/CustomerParadigm/OrderComments. The Order Comments for Checkout extension does not add in any additional database tables or columns into your Magento 2.0 store, so there is no need to remove anything directly from your mySQL database. Questions? Contact us at 303.473.4400 or Visit here to have a real person contact you now >>.